We love Craft Days at Jesus Church. Led by our Reader, Ailsa, who has a gift for craft work in its many forms, we have tried our hands at so many different things. The list includes card making, knitting, crochet, stitching, pompoms, paper flowers, decorations, marbling, stamping, p rinting, ribbonwork and much more. 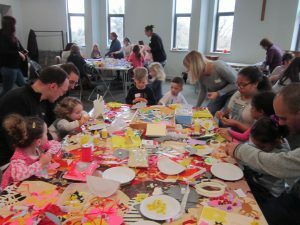 We have craft days twice a year on Saturday with activities suitable for absolutely all ages to enjoy together. It is easy to spend time chatting and helping each other while making new friends. Some of it is, of course, quite messy, but that only adds to the fun. The next craft day will be on Saturday 6th April with an Easter theme. Tickets will be available in the weeks before; there is a nominal charge – usually £5 per family or £3 per individual to help cover the cost of materials. The well-known Christianity Explored course is run usually once a year. We generally run both evening and daytime sessions to suit participants. Ian leads the course which is based on a study of Mark’s gospel and has a lively mix of bible study, video clips and discussion and is suitable for anyone who wants to find out more about the Christian faith. We also use it as preparation for those who want to be confirmed. If you might be interested find out more from Ian. A follow on course that we also run for those who want to continue and find out more – recently we have found it suits people to come on Sunday evenings at 8pm. It is a similar mix of video, discussion and teaching based on Phillippians and has been much enjoyed by those who have done it. For more information ask Ian or Heather if you are interested. Housegroups at Jesus Church meet on different days, currently Tuesday day and evening, and Wednesday evening, so there should be one to suit most people. Generally the groups meet every week in term time and there is a bible study related to the current sermon series for the groups to dig in to. Also important is the social time and members of these groups get to know each other very well and it can be a great source of support both spiritually and in practical ways too. Because some people who enjoy bible study are not free in the week to join a housegroup, Café Church is a regular part of our Sunday evening service cycle. This has a similar feel to a housegroup with social time over refreshments and a bible study in groups instead of a sermon. From time to time we break out of housegroups and do a short course or a special Bible study in a bigger group for a few weeks. Alternate years in Lent we join in various short courses offered in different churches in our LEP (local ecumenical partnership). 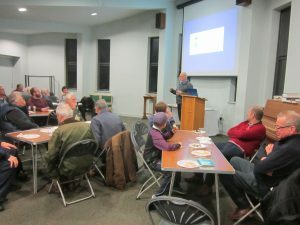 The Men’s Group was started by Steve Deall, who was with us while studying for ordination at Oakhill College initially to do Christianity Explored. They moved on to other things – always including food! Ian now runs this group once or twice a term and not to be outdone Linda runs a similar group for ladies generally involving pudding. Watch out for dates in the weekly noticesheet. The Mothers’ Union may be 141 years old but it is a young at heart organisation with its focus on helping family life thrive as it supports all kinds of projects through prayer and practical help. We have an active branch at Jesus Church that meets monthly on the second Monday of the month. Meetings vary between afternoon at 1.30pm and evening at 8pm . Members who can also take part in the monthly service in St Pauls Cathedral and some go on the Mothers’ Union retreat each year. At a typical meeting we start with a short service, hear a speaker or some other activity, and of course we have tea! Our singing is led by the Music Group at the 10.30am service on Sundays and on other special occasions. Practice is on Thursdays in the Charis Centre and that is where new music is first heard and all the behind the scenes hard work goes on to make our Sundays appear effortless! if you like singing or have other musical skills do speak to Susie who is our music leader.